“FREE MIXER” – this Friday! Mar.6/09 | Hot Jambalaya! 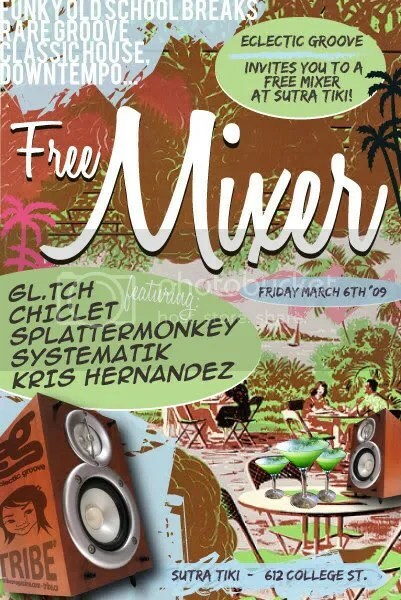 That’s right, a Free Mixer at Sutra Tiki, 612 College St. This is a unique venue with tons of potential for future warm weather jams – a must-see spot! Of course I do. I’ve just never had the right venue to showcase my collection! It was early 2000, I just started going to my first rave parties in Fredericton… and one morning the crew returned to Peter “Father” Fotheringham’s swank pad off-campus where we would habitually have a nightcap and a smoke prior to parting ways. This particular morning P.F. put on the Thievery Corporation’s Mirror Conspiracy album and by track 2 (Lebanese Blonde) I was hooked. P.F. always had jazz recordings on in the background when I called or visited, which I enjoyed, but this was different…intense, lush, and strangely compelling. When I started djing in Halifax in 2001-02; I dug around in Revolution Records and came across labels like Ninja Tune, Eighteenth Street Lounge , Cafe del Mar, and OM Records. Suggestions from friends, colleagues and fellow djs turned me on to the wide variety of “non-dance” i.e. rave music: nu-jazz, ambient, experimental, acid jazz, jazz fusion, abstract hip hop and turntablism, d’n’b, dub, reggae, classic house, and funk. I love it all and I’m thrilled to have the opportunity to share it with you. I’m especially stoked to see Splattermonkey in action! He’s been pumping out some great podcasts and mixes for the past year that I’ve been listening! Splattermonkey (MySpace, FB) has been scratchin’ and mixin’ records in Toronto for over 7 years. From his humble beginings at Nasa Dance pub on Queen Street and Liquids Lounge on College he was billed as “and guests” for the always classy JenEric Deep House parties. He then moved on to doing one offs and was an original resident for “Remix This” back when it was a monthly on Queen West. Now as a member of the WhitE LabeL EnthusiastS he is known as the “energon” of the group scratching up funky breaks for B-Boy Battles and throwing down some serious funk 45’s at his monthly party, “Ain’t That A Groove!” You can also check out his eclectic and unpredictable podcast at http://splattermonkey.podomatic.com.